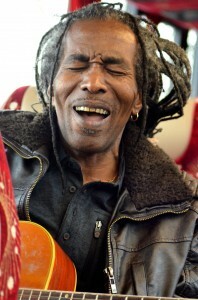 Golty Farabeau is a reggae musician born in the Seychelles in the Indian Ocean. His international career was launched when he was one a few selected artists from the Indian Ocean chosen to represent the islands’ music industry internationally. During this time he played at festivals in both the Middle East and Europe, as well as the French Caribbean. As well as composing and playing his own music, Golty performs traditional sega music from the Seychelles, seggae music – a fusion of sega and reggae and covers music by reggae luminaries such as Bob Marley and Peter Tosh, who have had a great influence on his own work. Golty Farabeau has released seven albums to date and currently plays with his UK-based band Jahmadou.